SHAH ALAM: South Korea's Kim Gi Jung-Kim Sa Rang exacted sweet revenge against their rivals Chai Biao-Hong Wei when they outclassed the Chinese pair in straight sets in the final of the Celcom Axiata Malaysia Open final today. Gi jung-Sa Rang had lost to Chai Biao-Hong Wei at the season-ending Superseries event in Dubai in the group stage late last year. But at the Malawati Stadium here this evening, the South Koreans were psyched up and went on to claim their prized Premier title. The fifth seeds had been on a hot streak here. 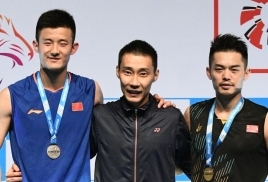 They defeated third seeded Chinese pair Fu Haifeng-Zhang Nan (quarterfinals) and world No.1 pair, Lee Yong Dae-Yoo Yeon Seong (semifinals). And today, the defeated the fourth-seeded Chai Biao-Hong Wei. Gi Jung-Sa Rang did well to win the first set 21-19 which clearly boosted their confidence. It showed in the second as they sailed to a 21-15 win in a game which lasted 36 minutes. "The first set was very important. 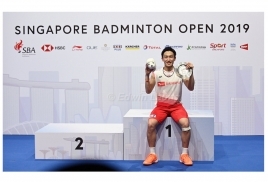 It was close in the first set, they (Chai Biao-Hong Wei) also knew the importance of winning their opening game," explained Gi jung. "After winning the first set, we were pumped up for the second and we just went out to win it. It feels very good to be winners today. It is our first Superseries Premier crown."